Experience the magic of essential Kerala, beaches, resorts to backwaters villas, houseboat holidays to hill retreats, rejuvenating ayurvedic therapies to resplendent festivals - a perfect travel place in India. The package of 8 nights and 9 days includes Munnar the gateway of Hills in South India. On the way you can also watch the lovely waterfalls of Cheeyappara & Valara. 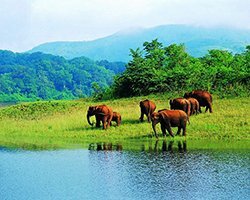 Thekkady, it offers diverse attractions wildlife sanctuary, hill station, and spice plantation. Kumarakom, a place best known for the honeymooners. It is a cluster of little islands on the Vembanad Lake. Alleppy, the Houseboat for a 20 hour long stay and 5 hour cruise through the world famous backwaters of Kerala. Kovalam- the internationally renowned beach destination and sightseeing of Trivandrum. Dont let this beautiful offer go. Book NOW!! Welcome to God s Own Country to enjoy your Kerala Holidays. Upon arrival our representative will greet you at Kochi Airport. Later proceed to Munnar, This small town in the Western Ghats is famous for its picture book towns, sprawling tea gardens, mist clad hills, sanctuaries and above all the climate is one of the most sought after tourist destination in India today. Munnar is the gateway of Hills in South India.On the way you can also watch the lovely waterfalls of Cheeyappara & Valara and later Reach & check in at the hotel and relax for a while amidst the comforts of your room. Explore the rest of the day along with the nature. Overnight stay at the Hotel/Resort.